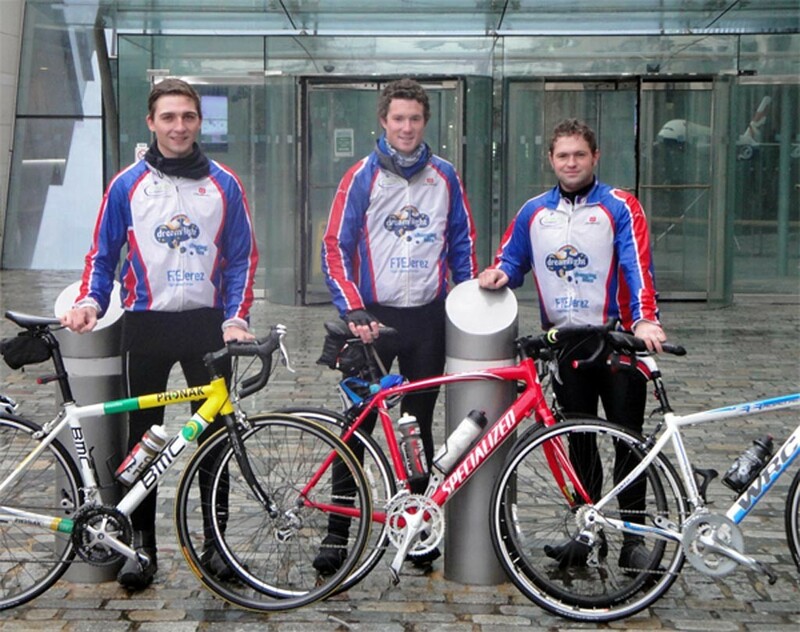 FTEJerez / BA FPP Graduates cycle from Jerez to London! When Martin Oakes, Jonathan Smith and Peter Williams, three British Airways Future Pilot Programme cadet pilots who were undertaking their flying training at Flight Training Europe (FTEJerez) in Southern Spain, graduated in late November 2013, they had their minds made-up. They were not simply going to catch the next flight back to BA in London to commence their type rating training there, but decided to rather cycle the 2400 km journey back to British Airways Headquarters at Waterside, London, Heathrow Airport. Their decision followed weeks of preparation for the long journey, the organising of sponsors, setting up of logistics, a back-up vehicle, amongst other preparations. Their main aim with the trip was to raise money and awareness for the DreamFlight charity in terms of which each October DreamFlight charters a Boeing 747 from British Airways to take 192 children who are, or have been, seriously ill or disabled, on a Holiday of a Lifetime to Florida. The children are then accompanied by over 160 volunteer escorts, mostly from the medical professions to ensure their comfort and well-being. Dreamflight aims to select children who would never otherwise have such an opportunity due to their medical condition and/or social circumstances. The adventurous cyclists left FTEJerez on 1 December and exactly three weeks later, on Saturday 21 December the trio arrived at Waterside, London, to be greeted by family, friends, their BA Liaison Pilots and the Pilot Recruitment Team! Not only have they, despite challenging weather, achieved their goal of making it there safely in three weeks but also managed to exceed their target of raising GBP 7.000 in order to enable 2 seriously ill or deserving kids to experience the opportunity offered by Dreamflight! The staff and students at FTEJerez would like to congratulate Martin, Jonathan and Peter on this fantastic achievement and commend them for their kind gesture of donating to a great charity. We are proud of them as FTEJerez graduates and wish them everything of the best in their future careers as British Airways pilots!